The first coffee table book to explore the 1,400-mile Florida Trail, this collaborative effort with landscape photographer Bart Smith weaves my anecdotes on hiking the trail with information about the cultural and natural wonders found along the way. When Bart Smith showed up at the Florida Trail Association Annual Conference in 2002 and looked me up at the mushroom workshop, I knew something was up. 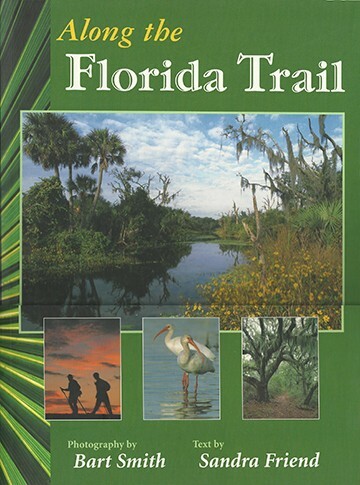 He’d worked on two beautiful coffee table books, The Pacific Crest Trail (with Karen Berger and Dan Smith) and The Appalachian Trail: Taking Me to the Hills (with trail legend Earl Shaffer), and was looking to expand his horizons by immersing himself in the beauty of Florida along the Florida Trail. I was already several years into section hiking the trail and had considered writing a trail narrative, so it didn’t take us long to hash out a plan and a proposal. Bart drove down from his home in Tacoma, WA and used my place as base camp and storage facility as he headed out on the trail; I continued to fit in backpacking trips and section hikes as time permitted. Our paths only intersected on the Big O and the Cross Florida Greenway, so we each experienced the trail in our own way. Bart’s incredible images provide an armchair journey down the trail, and I hope you’ll take the time to revel in my adventures and details on the history found along the Florida Trail. Softcover, 112 pages. OUT OF PRINT.